...Bellagio an Introduction and chronological history...Bellagio has proved an eternally popular destination and its easy to see why with its’ stunning panorama and breathtaking beauty. 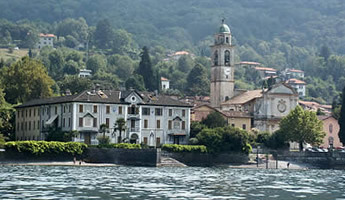 Bellagio is situated upon the extreme cape of the region that divides the Lake Como in two biforcations. 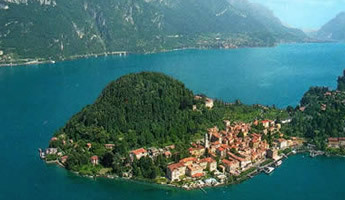 The tourist centre occupies the extreme part of the promontory, while the numerous districts are disseminated both along the lake shores and upon the slopes of the hills. The great Pleistocene freezings with their imposing flows comig from the Valtellina and Vlchiavenna modelled the actual landscape of the Como lake: for at least four times the glaciers went as far as the Brianza in the South. From an only glacial blanket only the highest tops emerged, one of them was the mountain S.Primo, which obliged the glaciers to divide themselves into two arms: from this mountain you can see the Lariano Triangle upon which Bellagio rises. The place, which was frequented in the prehistory, became a settlement in roman times, when it was the seat, as a hypothesis says, of a villa of Plinio il Giovane. Iin longobard time it was a fortified place with walls , in comunal time it lined up with the adverse to Como faction, and then the Visconti subjugated it and planned the fortifications. Towards the end of the XV century Ludovico il Moro gave it in feud to the Stanga; after that it passed to the Sfrondati, who possessed almost all the East side of the lake, and in the 1647 partially to the Airoldi. These and other families built villas and buildin , creating restructured and amplified parks expecially in the XVIII century until when Bellagio became one of the most notorious holiday resort in Europe. Bellagio, placed at the vertix of the Lariano Triangle, at the base of the promontory which divides the lake into two arms, the one of Como and the one of Lecco, is one of the most famous and distinguished holiday resort, with beautiful and noble residences and natural landscape features of notorious charm. At the end of the XVIII century the Count Pietro Venini made build a new sumptuous residence, called Villa Giulia, in his wife's honour. 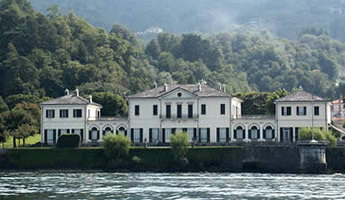 When the villa was erected, Venini bought wide lands, so his property extended from Regatola as far as Loppia. Far from the villa there is a wide flight of steps, surrounded by roof gardens full of fruit trees, which take to a small harbour and to a garden full of forest trees; it was a wonderful example of italian garden that then, during the XIX century was enriched by his successors with statues, fountains, esotic trees and precious essences. 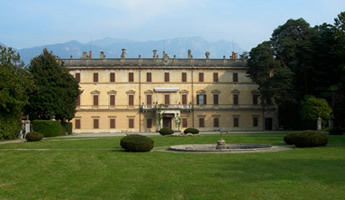 The Villa is a neoclassical building which was built for the Traversa in the XVIII century and enlarged in the lateral wings for Poldi Pezzoli from Giuseppe Balzaretto. The big park, that at the time of the Traversa was in the Italian style, was transformed in a big park in the English style. In the upper part of the garden, the mausoleum of the Gonzaga was built. Now in the park of the villa there is also the romanic church of Santa Maria di Loppia, that once was provided of a small closter that was destroyed during the construction of the wide path of Villa Giulia. The local cooking is rich of typical dishes of the lake and of the rest of Lombardia: the rise with perch fillets, the lavaret, the bleaks "in carpione", the dried allis shad "misultitt", the "Toc",the trouts, the polenta, the cured raw beef and among the cakes, the bread "Mataloc". The area around Como is renewned for the production of very beautiful silks of ancient tradition; the local handicrafts offers: the carved wooden ulive,the decorated blown glass, leathers and handmade shoes. The vegetation is of subalpine, alpine and mediterranean type. Pines and cypresses grow along the shores; the vine and the ulive grow along the sunny slopes; chestnuts, beeches, walnuts and conifers grow upon the montains. Flowers: narcissuses and may-lilies bloom in march, coloured azaleas rhododendrons and camellias in april and may; roses, oleanders and hydrangeas bloom from june to september, and perfumed olea fragrans and osmatus in september. To indicate the delightful and various palette of autumnal colours in Bellagio gardens and parks at the end of september and october. In the numerous shops you can find besides the handicraft objects, jewels, clothes, accessories, objects for presents, art objects and antiques, porcelains and potteries, jewelleries and souvenirs. 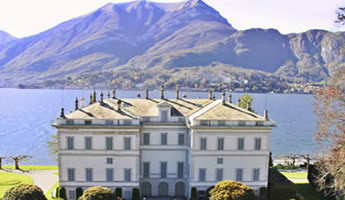 In Bellagio musical parades with chorus, instruments and bands are organized in the open space and in the striking churches; there are popoular patronal holidays during the summer nights and everyday musical entertainments in the numerous places. A luxuriance of trees and flowers is favoured by a mild and sweet climate. 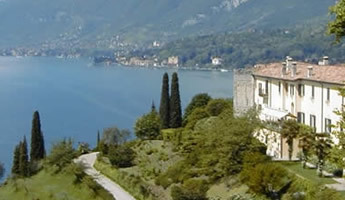 The medium temperature during winter is never below 6-7 C°, while during summer it is around 25-30 C°, mitigated during the afternoon by the characteristic "breva",the gentle breeze of the Lake Como.